Definition at line 60 of file imports.h. Definition at line 62 of file imports.h. Definition at line 192 of file imports.h. Definition at line 186 of file imports.h. Definition at line 106 of file imports.h. Definition at line 112 of file imports.h. Definition at line 93 of file imports.h. Definition at line 255 of file imports.h. Definition at line 99 of file imports.h. Definition at line 80 of file imports.h. Definition at line 86 of file imports.h. Definition at line 118 of file imports.h. Definition at line 124 of file imports.h. Definition at line 130 of file imports.h. Definition at line 67 of file imports.h. Definition at line 238 of file imports.h. Definition at line 78 of file imports.h. Definition at line 76 of file imports.h. Definition at line 77 of file imports.h. Definition at line 298 of file imports.h. Definition at line 301 of file imports.h. Definition at line 320 of file imports.h. Definition at line 270 of file imports.h. Definition at line 198 of file imports.h. Definition at line 54 of file imports.h. Definition at line 200 of file imports.h. Definition at line 272 of file imports.h. Referenced by _wtmpnam(), BaseGetVdmConfigInfo(), ChildWndProc(), CreateVdmMenu(), DisplayStatus(), DumpMemory(), EnumerateDevices(), EtfsOpen(), ExpLoadInitialProcess(), GetKeyName(), CTravelLog::GetToolTipText(), InitDialog(), IopStartRamdisk(), LdrpInitializeProcess(), LogToFile(), OnCreate(), PnpRootCreateDevice(), pSetupDebugPrint(), RamdiskCreateDiskDevice(), RecycleBin5_RecycleBin5_DeleteFile(), ShowLastWin32Error(), tirpc_report(), UniataConnectIntr2(), UpdateServiceCount(), UpdateStatus(), UpdateVdmMenuDisks(), VfdCreateDevice(), VfdDeleteDevice(), VfdLoadLink(), VfdSetLink(), VfdStoreLink(), WhoamiGroups(), and WriteRdpFile(). Definition at line 548 of file security.c. 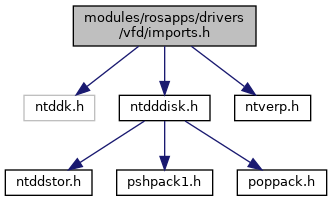 Referenced by CmpCmdHiveOpen(), and VfdIoCtlThread(). Definition at line 506 of file access.c. Referenced by CmLoadKey(), NpGetClientSecurityContext(), NpInitializeSecurity(), NtImpersonateClientOfPort(), NtImpersonateThread(), NtSecureConnectPort(), and VfdOpenCheck(). Definition at line 623 of file access.c. Referenced by NtImpersonateThread(), and VfdIoCtlThread(). Definition at line 1780 of file token.c. Referenced by NpFreeClientSecurityContext(), and PsAssignImpersonationToken().